For his final episode of The Rolling Wave, broadcaster Peter Browne listened back over some of his favourite music and songs—including recordings of whistle player Joe Cuneen from the Pete Shepheard Collection at ITMA. 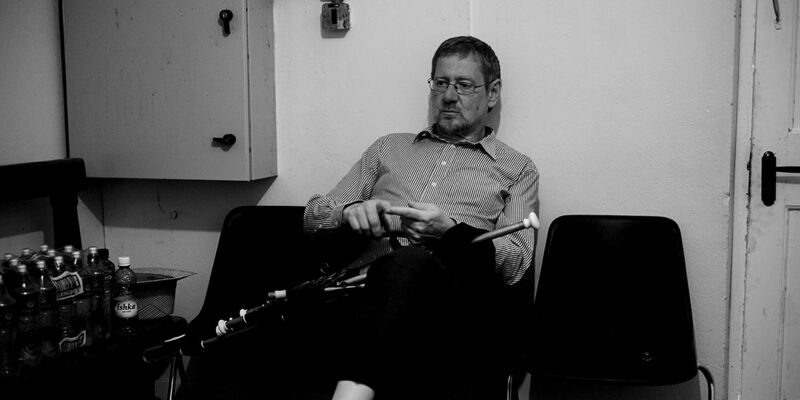 Peter Browne at the Willie Clancy Summer School, Miltown Malbay, Co. Clare, July 2013 (photograph by Tony Kearns). RTÉ, Ireland's national public broadcaster, describes The Rolling Wave as a programme with “a sharp ear and a close eye on the world of traditional and folk music in Ireland.” Much of the credit for those ears and eyes goes to Peter Browne, who has promoted the vitality of Ireland's song, music, and dance through his work as a broadcaster and uilleann piper. The board and staff at ITMA congratulate Peter Browne for a career of broadcasting excellence and offers warm wishes for his retirement. Over the years, Peter has enriched the ITMA Collection through valued donations of content. He also has drawn on ITMA’s richly varied resources about Ireland's song, music, and dance traditions for his broadcasts. We are delighted that he highlighted recordings from a recent donation to the ITMA Collection in his farewell episode of The Rolling Wave. In May 2018, collector Pete Shepheard entrusted ITMA with rare reel-to-reel recordings that he made in West Clare during the 1960s. The recordings feature, among others, duet performances of Willie Clancy with Barney McKenna and the playing of whistle player Joe Cuneen. Listen to Peter Browne’s farewell episode of RTÉ’s The Rolling Wave, broadcast 26 August 2018 at 9pm (IST).